The entire city is spun in stylish threads, as if Antwerp were pivoted on the very idea of fashion. Every corner I turned, funky, elegant, hip bodies sashayed about. It was hard to imagine that this Belgian city was once just a trade hub for merchants, middlemen and labourers. Except for the 19th century ramp walks, Antwerp was far from anything that exudes the swanky glow that it does today. It was in 1864 when a Parisian styled Grand Bazaar Shopping Mall in Groenplaats lay open as an obvious venue for fashion shows. It was one of the most coveted places to be seen for well-heeled women who borrowed glamour off voguish racks. Today, the luxury hotel that stands in its place still holds the defining magnificent glass dome, which allows a clear view of the sky, as well as a hint of the letters ‘Grand Bazar du Bon Marche’ in full view on the building’s frontage. Such evident whispers of history that happened only a little over a century ago is not as obvious in other parts of the city though. 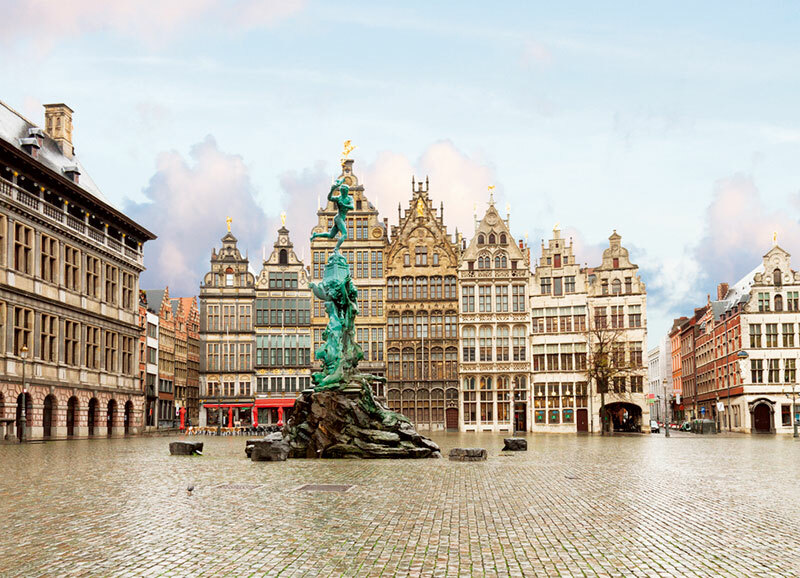 Everything in Antwerp is taken over by pathways macadamised for modern convenience and dressed in fashion stores, confectionary boutiques and diamond houses. 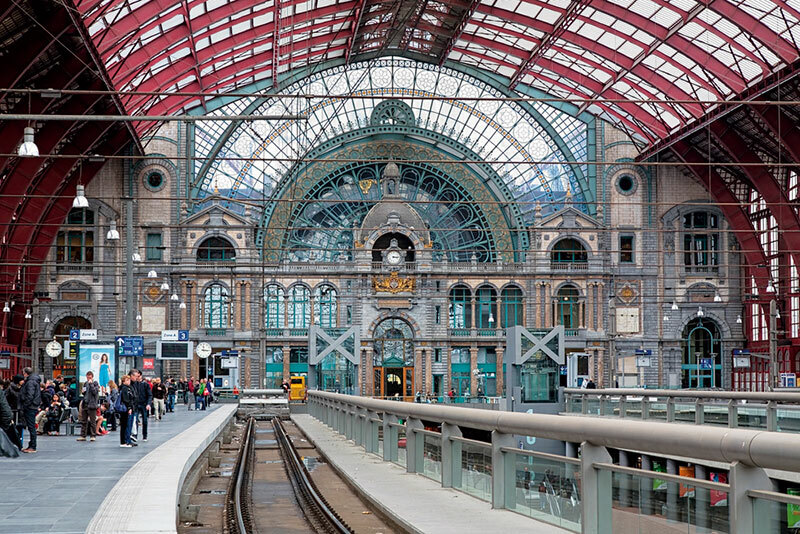 Even the main hall of Antwerp’s Central Station is occupied with them where ramp displays and city events are frequent occurances. Its carvings, sculptures, and varietal stores from early 1900s must make for a beautiful backdrop, for Newsweek has elected it as the fourth nicest station in the world. It took a while to get accustomed to the idea of jewellery shopping in a railway station. My local companion assured me that there was definitely no doubting their authenticity. What an ideal spot to pick up a diamond last minute for a displeased missus! I found it easier to trade the euros in my purse at the car-free Meir shopping district. Even the Stadsfeestzaal – a hall with a bevy of stores, a thirst inducing champagne bar, and a venue for stately celebrations, markets and exhibitions is situated bang in the middle of the street. Just in case you do feel low on energy, follow my trail into the basement supermarket for chocolates. Local cocoa brands here may be inexpensive, but their flavours are just as sumptuous as any gourmet chocolate boutique, if not more so. This place isn’t very far from the ancient guild houses – sixteenth and nineteenth century buildings – which used to make an eventful merchants’ square. Now it’s just a pretty cloister with cafes and pubs and a few odd boutiques strewn about. Since we decided to leg it all the way to retail therapy, the hedonistic detour was saved for later. After hastily conferring this area to be the only haven for a real shopper, I continued on my intent to splurge at the neighbourhood fashion houses. Bags in hand, just as I spun around the corner at the end of the row of boutiques, the famous artist, Peter Paul Ruben’s home bumped into us. It makes for a beguiling museum now. More than this, the Rockoxhuis caught my fancy a tad bit more with its varietal display of strokes from different ages. It was the home of Mayor Nicolaas Rockox in the sixteenth century of whom Ruben was a close friend. And apart from his paintings, those of Paul van Dyck and Wildens drape the walls as well. As I walked to the next bout of boutiques around Hoogstraat, my blindsided prejudice of Meir stood corrected. The area eulogises the very essence of Antewrp’s fashion in the form of the home-grown au courant haunts, and even exhibits Jef Lambeaux’s depiction of the city’s savior – Brabo. Constructed in close proximity of Hoogstraat, on Vrijdagmarkt is the Fashion Department, a school that has been teaching everything there is to know about design, shape and flair since 50 years. No wonder the square is always teeming with its many students, varietal gastronomy, booming music and cheery chatter. This wasn’t always the case here though. Interestingly it has been the focal point for auctions, haggling and trade of second-hand clothing. No one could have guessed that hand-me-downs found themselves here for at least 500 years – a paradox to what occupies the space today. With enough for the cupboard, and definitely the aching feet, the family vault needed a little something too. The next day saw building excitement in an invitation from the Institute of Gemmology. Leaving the very commercial zones for by-lanes dedicated to jewellery shops, banks, and diamond centres, the characteristics of the people seemed to change drastically. For one, Jewish men in their traditional attires, long beards and kippahs made up a healthy population in these precincts. The streets hold traditional Indian and Jewish restaurants, some of which display their certificate to serve kosher meals. And then there were the Indian men from the interiors of Gujarat whose accents didn’t vacillate from a single ethnic acoustic. Once inside the building, the intense security gave me a sense of how taxing it must be to shuffle stones of that value. I wasn’t allowed to take anything other than my notebook with me into the institute. Grading machines in the first room is where I was ushered. And this is also where I was shown how a diamond could be worked on to hold our initials or signage on its girdle. I knew what I was taking back for myself. The next station showed me how the robots computed specifications of the diamonds after they were manually checked by a trained eye. Jumping into the midst of a diamond’s birth felt like walking into one of those Discovery Channel broadcasts. This wrapped up two brilliant hours with a call for kosher lunch in one of the adjoining alleyways. And this also concluded my two days of retail therapy in Antwerp. 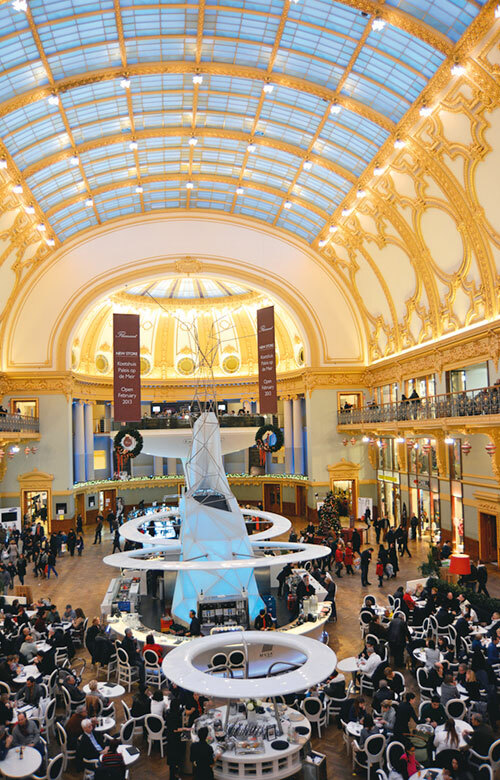 Antwerp sure has come a long way with it not only being prominent on the map of luxury, but also being one of the largest diamond contributors to the world, making up 10 per cent of Belgium’s income. This is apparent from the city’s coveted annual diamond cocktails, open to the rich and famous, amongst whom one lucky invitee may be fortunate enough to ‘accidentally’ sip from the glass which has a sinking diamond.